Our new report presents a clear picture of the global karaya gum market for a projected period of 10 years. Our analysts have gone the extra mile to give detailed information on the market size, revenue forecast, drivers, restraints, trends and opportunities of all the seven regions that have been covered in this report. Apart from regional insights, we have also given comprehensive information on various segments and sub-segments of the karaya gum market. For the better understanding of the entire market, we have divided the market based on form, end use industries and region. The global karaya gum market has been experiencing significant growth; however, it is still at a growing stage compared to other products in the market. Suppliers are entering into long-term contracts with karaya gum products manufacturers to avoid increase in product prices, and karaya gum suppliers/retailers are also focusing on entering into long-term contracts to sustain in the competitive global market. The key component of this report is our unique analysis and recommendations on the global karaya gum market. The report presents an overview of the global karaya gum market. The overview consists of market definition and market taxonomy. The next section focuses on the market dynamics and underlines factors influencing the growth of the global karaya gum market. The analysts have also provided key strategic recommendations for both existing as well as new players in the market to emerge sustainably profitable. The general market scenario is assumed for karaya gum sales and driving factors are assumed to develop the market forecast. 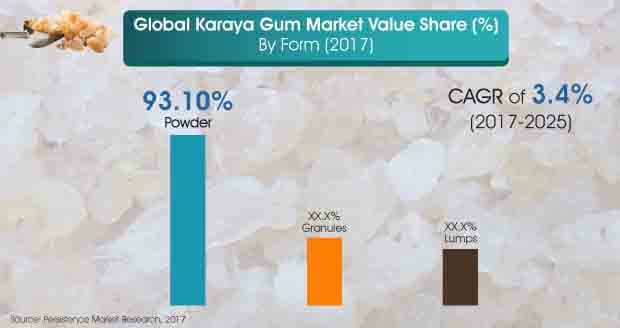 The report also covers the competitive landscape that provides a dashboard view of companies that manufacture and provide services in the global karaya gum market. The report consists of company profiles of some of the key players and a strategic overview of mergers and acquisitions along with companies’ expansion plans across different regions. The analysts have performed systematic and exhaustive secondary research to analyze the required data points to arrive at the overall market numbers. We have identified market players across the value chain of technology developers, manufacturers, and distributors in the global karaya gum market. Detailed questionnaires have been developed for each node in the value chain to extract the required market information through primary research interviews. These interviews are conducted using distinguished essential resources. The data thus acquired is validated using the triangulation method, wherein secondary and primary research along with our independent analysis contributes to the final data. Decline or increase in prices over the forecast period is based on historic market trends; any decline or increase in prices over the forecast period is kept linear across countries. For better and simplified understanding of the report, the data is represented using charts, info-graphics, and presentation of key findings by region that provides actionable insights to players aiming to succeed in this market. A large number of regional companies currently operate in the global karaya gum market. These local players are not only price regulators but also account for almost 65% of the global market share. India is the target region in the global market for karaya gum owing to the easy availability of resources and the ever increasing demand for pharmaceuticals and food and beverages in the global market. Some of the key players are also located in North America and Europe. Multinational players operating in this market include Spectrum Chemical Manufacturing Corp and Merck KGaA Ingredion. Local players currently dominate the market owing to the cheap availability of raw material coupled with their strong focus on the natural gums portfolio. This has however made it difficult for international players to penetrate and sustain in the global market for karaya gum. In order to meet the high consumer demand, manufacturers at the regional level are strengthening their position in the market by updating and upgrading their manufacturing facilities. Karaya gum is generally utilized in the food and beverages industry as an emulsifier in various product applications. It has inherent properties such as – allowing scattering of oil into water and ensuring the stability of beverages to prevent precipitation. Karaya gum is steady even in a low pH environment, and is a moderately fundamental element for beverages. It is less viscous in water and in other liquids and does not change the texture or the flavor of the original beverage. All these advantages of karaya gum are being recognized by manufacturers in the food and beverages industry, who are discovering various product applications of karaya gum in different food products. The demand for karaya gum is also growing in the bakery industry. Karaya gum is a natural binder and its consumption does not cause any harm. All these factors are creating a positive impact on the global karaya gum market. In the biotechnology era, manufacturers operating in pharmaceutical industries are showing their inclination towards the usage of naturally-derived polymers in drug formulations. This is because of various associated advantages such as these products with natural ingredients are non-toxic and inert; and these polymers have more benefits over synthetic products. Manufacturers are also using natural ingredients as raw materials in their products as there is tremendous demand for natural and healthy products from consumers. Gums are potential candidates in novel drug delivery systems; while in other applications such as bulk laxatives, binders in tablets and dental adhesives, gums are increasingly being used as suspending agents. Among the form segments, the powder segment is expected to represent the highest CAGR of 3.5% and is also anticipated to gain 63 BPS over the forecast period. The powder form of karaya gum is the widely used form in the food and pharmaceutical industry, and hence is expected to account for the highest growth in terms of volume. Powder segment is expected to dominate the karaya gum market in revenue terms in 2017, and is projected to continue to do so throughout the forecast period. This is the most attractive segment, with an attractiveness index of 2.9 over the study period. The powder segment was anticipated to account for more than 90% value share in 2017, and will retain its position in terms of revenue share through 2025.